Sometimes when I feel sort of ambivalent about a recipe I’ve made I ask my friends who’ve sampled the food to give me their brutally honest opinion as to whether it’s blog-worthy or good enough to post. I certainly don’t want a site that has a long list of mediocre recipes. This rice, however, I had zero reservations about. It’s super fragrant, light, fluffy, with a subtle complexity. 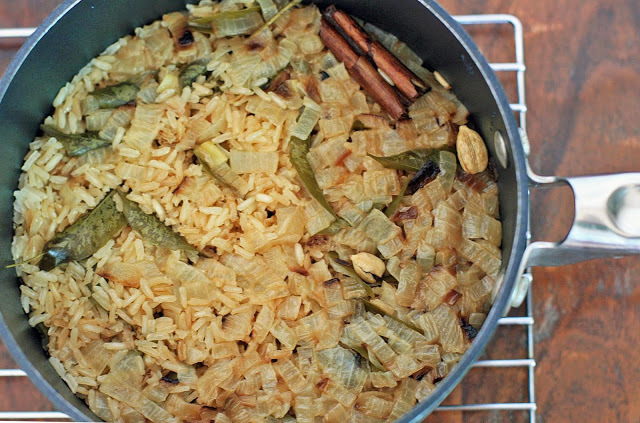 I would have never thought to add cinnamon or cardamom to my rice but it works. The most important step is to really toast the rice well; that will make each grain of rice burst and split, creating that beautiful fluffy texture. I also highly recommend making sure you have the cashews, raisins and burnt onions for garnish. The rice is still amazing without them, but I promise these three are like a magic trifecta of awesomeness. Heat the butter in a large saucepan over medium heat. Add the onion and fry until golden. Add the curry leaves, cardamom, cinnamon stick and rice and cook, stirring often, for five minutes. The rice should be toasted and golden in color. Add the broth and bring to a boil and then reduce heat and simmer, covered, for about 20 minutes, or until all of the liquid has been absorbed. Remove from heat and let stand, covered, for five minutes. 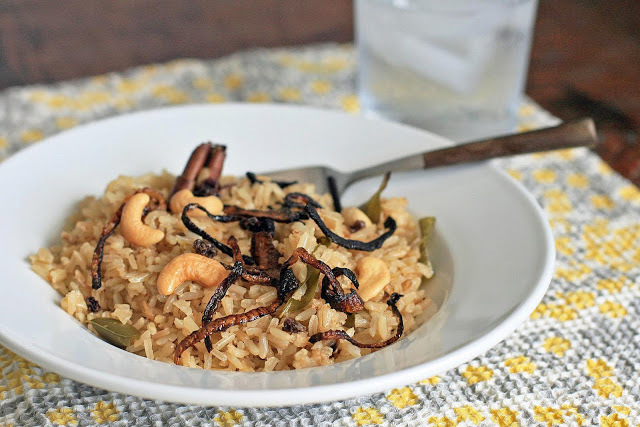 Fluff rice and garnish with cashews, raisins and burnt onions. Note: it’s possible that brown basmati will also work, but since I used jasmine I can’t guarantee that the basmati grains will split after toasting; I think it has to do with the bran thickness. Regular medium grain brown rice will definitely not work for this recipe.